Sir Bradley Wiggins has broken the iconic hour record by completing a distance of 54.526km (33.88 miles). The 35-year-old smashed the previous mark, held by fellow Briton Alex Dowsett, of 52.937km (32.89 miles) that had been set in May. 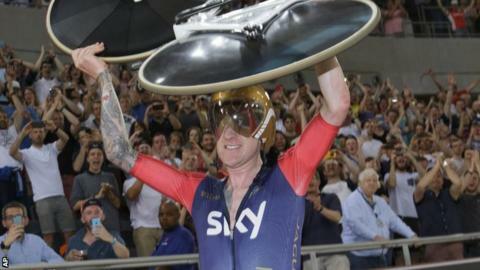 Roared on by a capacity crowd at Lee Valley VeloPark in London, Wiggins became the sixth rider to claim a Tour de France title and the hour record. "I'm just glad it's done," he said. "It was torturous." Wiggins, who becomes the fifth person in the past nine months to break the record, joked: "That's the closest I have ever come to what it's like to have a baby." Wiggins, a multiple Olympic and world champion on track and road, surpassed Dowsett's record of 212 laps, set in Manchester, with 1min 42secs to spare and eventually completed 218 laps. But the 2012 Tour de France winner fell short of the target he had set himself of 55.250km, or 221 laps. "You're constantly looking at the clock counting down," he said. "When you're out there, you never think it's coming to an end." Wiggins joins five other riders, among them Eddy Merckx and Miguel Indurain, to have won the Tour de France and broken the hour record. "I always compare myself to the greats and I am just glad to be in the company of those guys," said Wiggins. "To get up there and do that, to put yourself on the line, takes a lot of courage and it's a mental game as much as anything." Former British cycling performance director Dave Brailsford said it was "an honour" to witness the occasion. "Bradley rode well on what was a heavy and hard day," he said. "I'm so pleased for him. It's his day and he is such a magnificent athlete." Since the UCI, cycling's world governing body, unified the regulations surrounding the event last year, four riders have held the record: Germany's Jens Voigt, Matthias Brandle of Switzerland, Australian Rohan Dennis and Dowsett. "It was never really in doubt, was it? "The only question in the stifling heat of the Olympic velodrome before Wiggins rolled off - ahead of Sky Sports' schedule - was on whether he would take the record out so far that it would frighten off challengers for a generation. "That is still the question as the temperature drops from the optimal 28 degrees to something more bearable: is the best part of 34 miles one of those iconic rides, or just a very long way? "One thing is for certain, he did it in less than ideal conditions - the high-pressure front over London this weekend probably cost him another three laps and he did it at sea level - which means Wiggins leaves this stage with his audience wanting more. "Not a bad way to go, when you think about it."